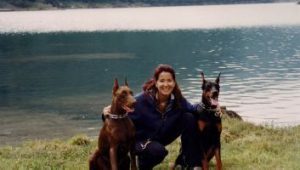 My breeding started together with the love story I had with my wife Monica who made me appreciate the magnificent Dobermann dog breed. Monica had loved these dogs since her childhood even though, she never owned one. She was attracted by the beauty of these athletic animals, most by their intelligence and by the complicity between them and their owners. After attending a Dobermann Training Social Championship I started reading up this matter and I looked for the breeders having puppies for sale. At last near Modena we found one owning a litter of both black and brown puppies. Monica would have liked a tawny black Dobermann male but, at a first sight, she surprisingly felt in love with a tawny brown puppy that, thanks to his brillant warm and playful temperament, had attracted me too so, without thinking twice, we brought him home. Eric (that was his name) was Monica’s wedding present from her twin sister Manuela. Our breeder who was an espert, suggested we start Eric’s education at a dog training centre, that was the beginning of our adventure in which we are still presently envolved. Six months later, Monica and I decided to buy a dog for me too so Bandolero Stanco, a black Dobermann male, joined us.Eric and Bando grew up togeher and strangely harmonized. We started training these two dogs our own and, even if sceptical about the result of that experience, we had some awarding success in “Utility and Defence” important competitions. In 2004 Monica and I decided to buy our first female; Happy Lady, strongly desired by me (I drove 1600 km in one day to take her home) joined the team. With Happy Lady a new adventure started and I enjoyed a lot as she played with anything I would propose to her. Her training was real fun. Afterwards it was Unica’s turn, a female gifted with great morphological and temperamental talents, that I gave Monica as a gift in 2005. With her we started collecting the first glories in the most important Italian and European events.Then in 2008, after our two females had been given the ZTP, we thought it was time to have our own litter of puppies. (ZTP is a character test which some Utility and Defence breeds including Dobermann are subject to, in order to determine the qualification of the dogs to breed in morphology, equilibrium and temperament. 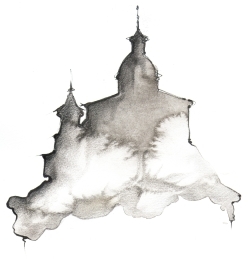 After the former litter we decided to transform our great passion in a real profession so, in 2010 we opened our activity under the name “DEL COLLE DELLA GUARDIA” to honour the Hill hosting the San Luca’s Cathedral deemed as landmark by all citizens of Bologna. And the story goes on………….